Many photographers can tell you the exact moment they learned to see light. It’s a milestone for us all. Another milestones for me was learning to research my photography trips, rather than just showing up and taking pictures. 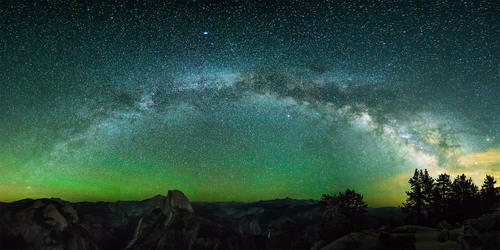 This photograph of the Milky Way arching over Half Dome at Yosemite National Park was no accident. I didn’t just show up, gleefully see that the Milky Way was there and take a picture of it. I spent time beforehand to see what time the Milky Way would rise on the exact dates I’d be there. I then checked to see which direction in the sky the arch and celestial center of the Milky Way would be. Finally, I checked Google Earth to see which landmarks in Yosemite had good vantage points facing in the direction of the Milky Way. And since I only had one night in the park (I was just passing through before leading a photography workshop in Mammoth Lakes) I decided that Glacier Point would be my target. When I arrived at Glacier Point that night, I just walked the short hike to the overlook, set up my Sony α7S and took a 7 image panorama to capture the entire arch. All my work had paid off, and the Milky Way was right where I knew it would be. I chose the α7S because of it’s incredible low light capabilities at high ISO levels. I used my Sony Zeiss FE 16-35 f/4 lens because of the wide angle it offers. I captured the images at ISO 4000, f/4 and 30 seconds each (I also used Long Exposure Noise Reduction on each shot so there was a minute between each exposure).